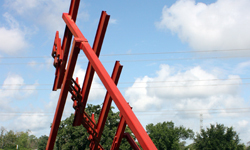 A well-known part of the Memorial Park landscape since 1984, ¾ Time is the work of San Antonio native Ben Woitena. 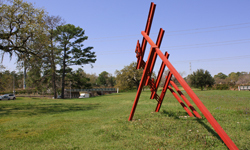 The welded steel composition is painted a bright, eye-catching red, which is offset every spring by a lawn of bluebonnet blooms. The park’s Living Bridge, which is draped in green plants, is its backdrop. It was restored in 1996. Woitena graduated from the University of Texas at Austin in 1964 and received a Master’s Degree from the University of Southern California in 1970. He has taught at the Glassell School of Art in Houston, and has been the subject of several video documentaries. His work Time Line is admired daily by thousands at Terminal E at Bush Intercontinental Airport.